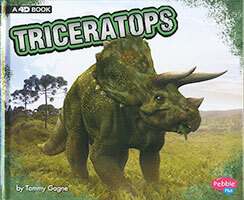 Take a trip back in time to the Cretaceous Period to learn about triceratops! With sharp horns and a large frill around its neck, triceratops comes to life through immersive, vibrant images. Readers will be enticed to learn more about the dinosaurs' appearance, behavior, and their prehistoric habitat. Realistic illustrations and easy-to-read text help any young reader find something to enjoy. Bring augmented reality to your students by downloading the free Capstone 4D app and scanning for access to an online article, video, and discussion questions.